Assalamu Alaikum, … and what is its ruling on praying in her house? Should she cover her feet since covering the ‘Awrah is one of the conditions of prayer? i.e. to loosen upon themselves their outer garments (Jalabeeb) downwards, and this loosening meant in the word “draw” (i.e. loosen) can’t be achieved except by having the robe at least reaching the feet and covering them. If the feet were covered with socks or shoes, the loosening requirement has been achieved as if the Jilbab has reached the feet, but if they weren’t covered with socks or shoes, then the Jilbab should reach the floor in order to cover the feet, and this means that the feet are part of the ‘Awrah. b. It was narrated by Ibn Umar that he said: The Prophet ﷺ said: «مَنْ جَرَّ ثَوْبَهُ خُيَلاَءَ لَمْ يَنْظُرِ اللَّهُ إِلَيْهِ يَوْمَ الْقِيَامَةِ فَقَالَتْ أُمُّ سَلَمَةَ فَكَيْفَ يَصْنَعْنَ النِّسَاءُ بِذُيُولِهِنَّ قَالَ يُرْخِينَ شِبْرًا فَقَالَتْ إِذًا تَنْكَشِفُ أَقْدَامُهُنَّ قَالَ فَيُرْخِينَهُ ذِرَاعًا لاَ يَزِدْنَ عَلَيْهِ» “Whoever trails his garment out of pride will never be looked upon by Allah.” Umm Salamah said: “O Messenger of Allah, what should the women do with the hem of their clothes?” The Prophet said: “Lower it by a hand’s length.” She said: “What if their feet are uncovered?” The Prophet said: “Lower it by an arm’s length but not more than that.” Reported by At-Tirmidhi who said that this Hadith is Hasan Sahih. In conclusion, the feet are ‘Awrah which must be covered like any part of the ‘Awrah. (ie, to loosen upon themselves their Jalabeeb downwards, and this loosening meant in the word “draw” (i.e. loosen) can’t be achieved except by having the Jilbab at least reaching the feet and covering them. If the feet were covered with socks or shoes, the loosening requirement has been achieved as if the Jilbab has reached the feet, but if they weren’t covered with socks or shoes, then the Jilbab should reach the floor in order to cover the feet, and this means that the feet are part of the ‘Awrah). Abu Bakr said: This is because all of her body is awrah, it is not permissible for an unrelated man to look at it, except these parts. This is evinced by the saying of Allah: ﴿وَلَا يُبْدِينَ زِينَتَهُنَّ إِلَّا مَا ظَهَرَ مِنْهَا﴾ “and not to show off their adornment except only that which is apparent” [An-Nur: 31]. It has been reported that this is the kohl and the ring. So, it is evidence that her hands and face are not awrah. The Prophet (peace and blessings of Allah be upon him) said: «لا يقبل الله صلاة حائض إلا بخمار» “Allah does not accept the prayer of any (woman) who menstruates, except with a khimar”. This shows that her head is awrah, And it is obligatory to cover ‘awrah in prayer: It should be covered in prayer, but the hands, face, and feet are not awrah, and it is not necessary for her to cover them in prayer) End. This view is a weak opinion (Marjuh) as we have shown above … But we do not want to adopt in this issue since it is a worship (Ibada). 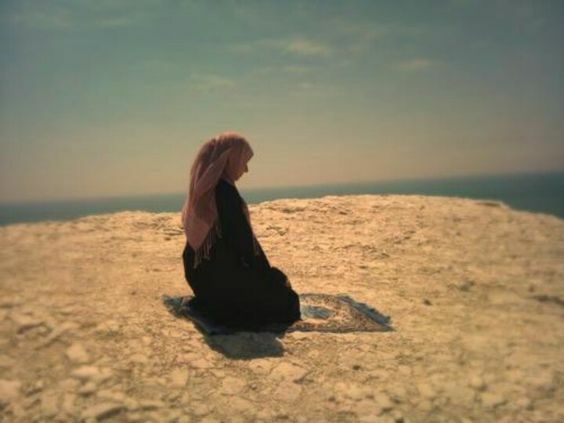 A woman who prays according to the Hanafi school does not have to cover her feet in prayer … but what I outweigh is that the feet must be covered in prayer because they are ‘Awrah. 1- That which I outweigh is that the feet are ‘Awrah, and we adopt this in public life. So it is not permissible for a woman to go out of her house except with her Jilbab that covers her feet, whether to reach the floor enough to cover the feet when walking, if she is walking barefoot, or the Jilbab to reach the ankles if she wears proper socks to cover the feet, so that the “Idnaa” (draping), that is the loosening of the Jilbab to the feet is achieved as we explained in detail in the Social System. 2- As for the covering of the feet in prayer, we outweigh to cover them, but we do not adopt in this matter because it is a worship. Women who follow the tradition of Abu Hanifa do not have to cover their feet during prayer. This is what we see in this matter, and Allah knows best.